When is this type of surgery useful for foot & ankle problems? Presently, arthroscopic surgery is most commonly used for some painful ankle conditions. Often times, patients who have experienced a past injury (i.e. sprained ankle) continue to have persistent discomfort that may eventually become disabling. Arthroscopic surgery proves to be very effective in treating this condition. Heel Spur Syndrome, specifically plantar fascitis, is another common foot condition that can be treated by arthroscopic means. When conservative therapy fails to alleviate the patient's heel pain, Endoscopic Plantar Fasciotomy has proven to be effective. 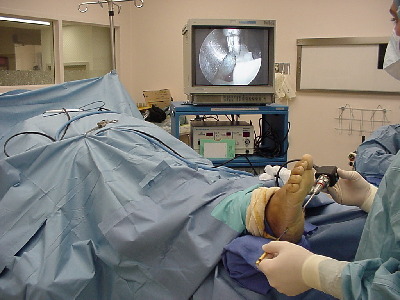 In some cases, the arthroscope is being used to diagnose problems of the big toe joint as well.